The test launch of the sea-based Bulava intercontinental ballistic missile ended unsuccessfully Tuesday. The self-destructing mechanism of the missile was activated soon after it had been launched from the Dmitry Donskoy nuclear submarine, Interfax reports with reference to a source at the Russian defense industry. The first and the second stages of the missile operated according to a standard procedure, but a malfunction occurred during the operation of the third stage. The missile was given a command to destroy itself. The self-destruction of the Bulava rocket caused no injuries. It was previously reported that Russia's top military officials viewed this test as a decisive launch. The military administration of the Russian Federation was going to pass the Bulava missile into service to begin a serial production of the complex in case of a successful launch. There were seven launches of the Bulava rocket made before, and four of them ended unsuccessfully, news agencies report. The Dmitry Donskoy strategic submarine conducted a successful test-launch of the Bulava rocket from the White Sea. The missile is expected to be passed into service in 2009. The intercontinental solid-fuel ballistic missile Bulava was designed by the Moscow Institute of Thermal Technology. The missile is capable of carrying up to ten individually guided nuclear blocks and striking targets within a radius of up to 8,000 kilometers. The missile is designed for Borei class nuclear submarines, which will be outfitted with 16 missiles each. The heavy nuclear-powered submarine Dmitry Donskoy was prepared to conduct the missile tests. 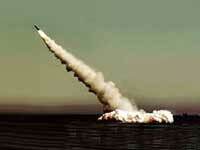 Several test launches of the Bulava missile ended unsuccessfully in 2007. The Bulava carries the NATO reporting name SS-NX-30 and has been assigned the GRAU index 3M30. In international treaties, the common designation RSM-56 is used. The decision on developing the “Bulava” missile was adopted in 1998 after three unsuccessful tests of the “Bark” missile of the Miass Construction Bureau named after Makeev. The Bulava design is based on the SS-27 (Topol M), but is both lighter and more sophisticated. The two missiles are expected to have comparable ranges, and similar CEP and warhead configurations. The Russian military developed Bulava to possess advanced defense capabilities making it nearly impervious to existing and future missile-defense systems. Among its claimed abilities are evasive maneuvering, mid-course countermeasures and decoys and a warhead fully shielded against both physical and EMP damage. The Bulava is designed to be capable of surviving a nuclear blast at a minimum distance of 500 meters. Prime Minister Putin has stated that Bulava could penetrate any potential anti-missile defense system. The current version of the Bulava is able to carry up to six MIRV warheads, future variants are expected to carry a maximum of ten. A full-capacity payload requires the forfeiture of all final stage countermeasures and of some shielding.